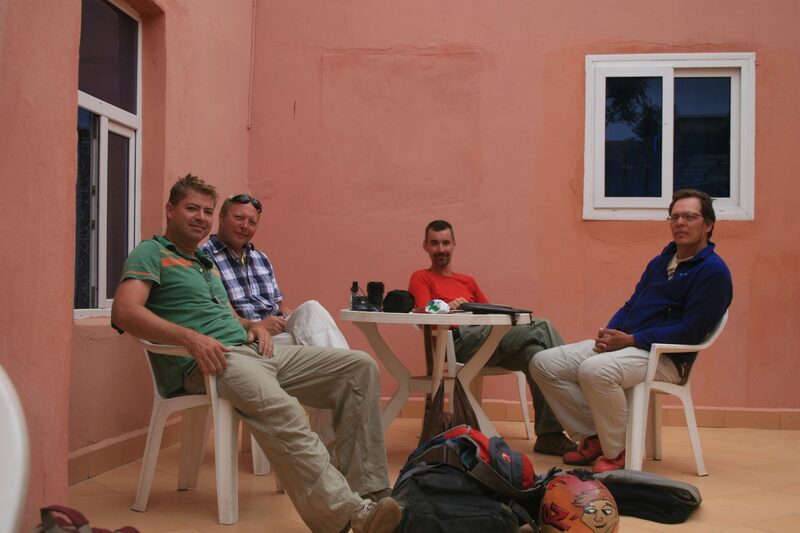 Wrong Way Round Sahara - Part Eight: What would Bear Grylls do? 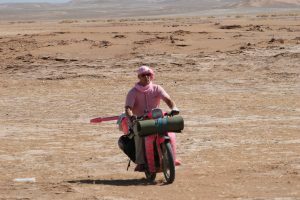 Wrong Way Round Sahara - Part Eight: What would Bear Grylls do? To most people the French Foreign Legion conjures up images of men with rifles trudging up sand dunes. It was with some surprise therefore that we found ourselves sat in their barracks drinking cold beer. Just a few hours earlier we were well and truly in the camel poo. 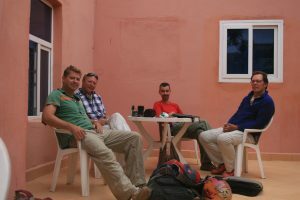 It was two days previous that we rolled in to the oasis camp at Erg Chigaga. More by luck than judgement. We were thankful for the shade, water, and somewhere to rest up until mid-afternoon. Only then would the temperature be bearable enough for us to ride without being microwaved. In camp it was too hot to sleep and it’s not like you can talk about the weather. Passing the time was a slow process. We slipped in to a dazed silence, only permeated by the rustling of the palm leaves and the croaking of the frogs. There was a moment when we thought we might be hallucinating but we all heard it. If there was one thing none of us was expecting to hear in the desert, it was the sound of frogs. The camp had a small water channel about six inches across running right through it in which a serious frog party was occurring. Oases are not just for weary travellers then. 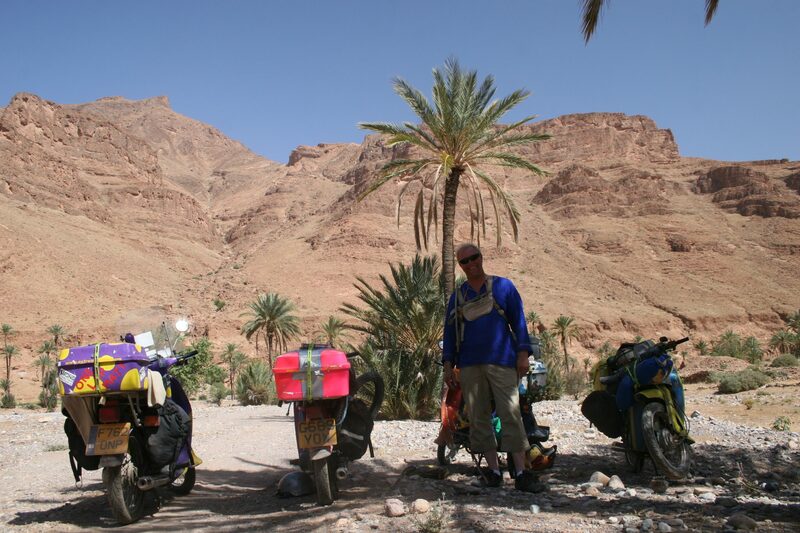 Our plan was to navigate towards the Draa valley. 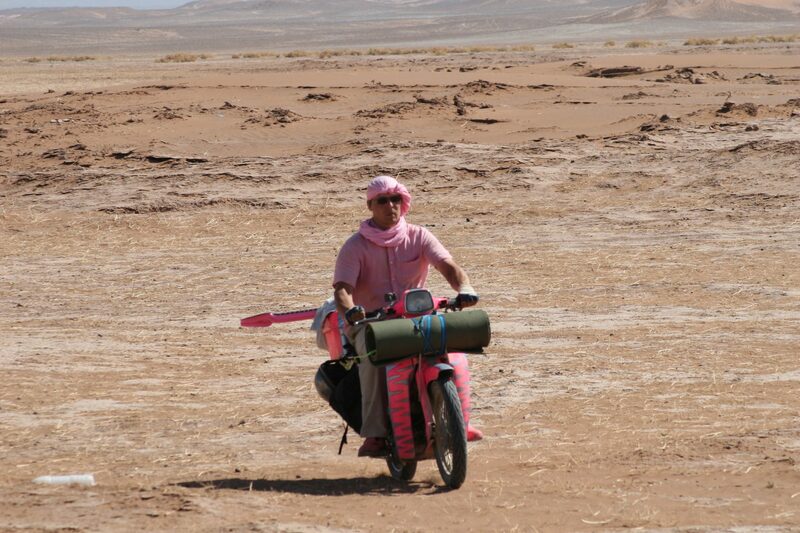 If we set off early evening the locals in camp estimated two further days riding. This was based on riding for 8 hours a day, sheltering during the midday hours. We filled our camelbaks and strapped another twelve litres of water on to Charlie’s bik. It fitted perfectly in the space where the pannier containing all his clothes used to be. We can only apologise to the person who found it and the fossilised remnants of Charlie’s undercrackers. Unfortunately the berbers only had enough food to sustain themselves while they tended the camp so there was none spare. All we had was biscuits, some stale bread and some jam. Of more immediate concern however was Greg’s health. To the trained eye heatstroke is an acute condition of hyperthermia caused by prolonged exposure to excessive heat. To the untrained eye it means a person with no sense of humour who is generally useless. 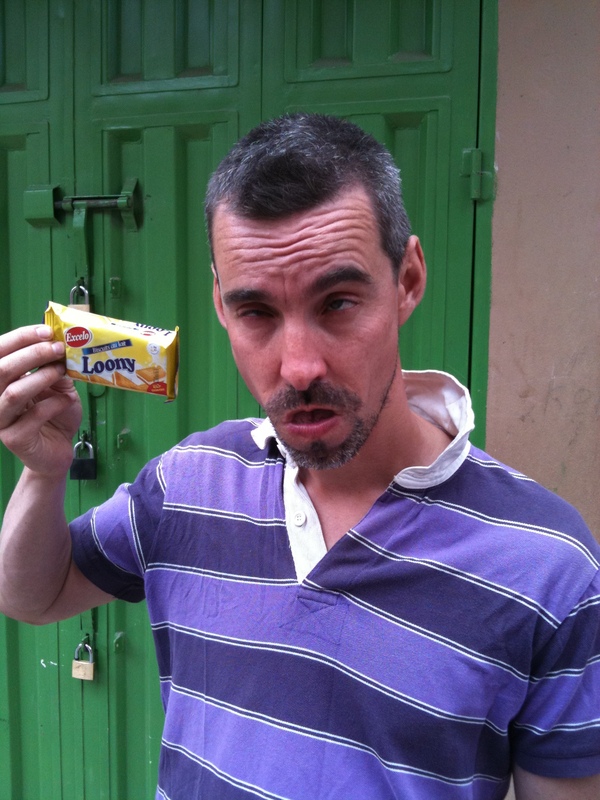 So it was only when Greg lost his sense of humour that we knew something was not quite right. Over the last couple of days he had become more and more withdrawn. Whenever we stopped to take photos he would just sit on the bike with his head on the handlebars. In the camp he had barely said a word. We noticed he had started to look pale (which is quite an achievement with sunburn). At first we had ignored it, deciding that Greg was just having a tougher time than the rest of us. Later he admitted that he’d been puking and was having dizzy spells. Since this could not be attributed to 10 pints and a kebab, we realised he was suffering with the intense heat. In the circumstances we didn’t have a lot of options except to get out of the desert. At 4.30pm we set up off continuing west, following the setting sun. We had about two hours of daylight and although it wasn’t much, psychologically we all wanted to leave the camp and feel as though we were heading somewhere. As it happened that ride was one of the most spectacular. We descended on to a flat plateau flanked by rocky hills. Behind us the sun was disappearing in a fiery orange glow. We were in an ancient dry lake bed. For us it was a moment to savour. A vast area of billiard smooth sand, sun-baked so that it rode like tarmac. Even though time was of the essence we couldn’t resist riding in massive circular loops round and round. For that moment we were in our own personal playground and all our troubles were forgotten. We set up camp, tired by happy. Apart from Greg who was just tired. The next day was quite simply, horrendous. We set off at first light as planned. Riding for hours across dusty barren plains, eventually the terrain began to get rocky. This meant we were gradually leaving the open desert behind and getting closer to the Draa valley. Rocks made the going tough. The bikes didn’t have enough suspension travel to soak them up. We ended getting bounced all over the place and walking the bikes over some boulder fields. There were a couple of lonely looking trees up ahead. We decided to stop and make the most of the shade. Greg was some way back in the distance but still making progress. As we stretched our legs Charlie crouched down, sighed and put his head in his hands. The empty space on his bike where his pannier full of clothes used to be, was an empty space again. This meant all our spare water was now missing. As we stood contemplating this disaster, Greg had stopped two hundred metres away. He’d got off his bike and appeared to be looking at his feet. “He’s found the bag of water!” we thought. But curiously Greg just stayed in the same position staring at his feet. This went on for about five minutes so Charlie walked back to check on him. It turned out Greg had not found the water. His bike had cut out and he had exhausted himself trying to get it started. Charles got the bike going and set about our disaster recovery plan. We put Greg in the shade and Oz stayed with him. Meanwhile Charlie and Kaspars headed back the way we had come to look for the lost water. Two hours later they returned. With nothing. This was bad news in any circumstance but Greg was already at a low point. He simply wasn’t in the right frame of mind to deal with it. Within minutes he was hyperventilating and approaching a state of panic. We tried to keep him calm, sat him down and lied that we weren’t far away from help. Then he started dry retching. We considered our options. 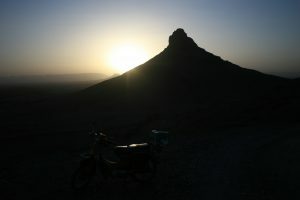 The light was fading and it was near impossible to ride in those conditions without risking an accident. We’d been drinking freely from our Camelbaks thinking that we would just top up from the spare water. Of which we now had none. Five litres between four of us. It had to last all night and as long as it took us to find more water. The next day? The day after? Our only option was to pitch tent and try to sleep. The theory being that if we were asleep we wouldn’t drink anything. Lying in our tents with mouths like a ricecake, all we could think about was water. And ice creams, and fresh orange juice. Suddenly the Sahara desert felt oppressive and claustrophobic. Not appealing. In any case most of us hadn’t passed more than a dribble in two days. It was a long, uncomfortable night. During the day we’d been drinking from our Camelbaks and spitting out the first mouthful. Where the water sits in the tube it heats up to hot tub temperature. Now we would have done anything to have those scraps of water back. At first light we were up and gone. Rejuvenated by a breakfast of strawberry jam and bread so stale it was like eating MDF. When we say “up and gone” we mean up, but not actually gone. As we packed the bikes Charlie found the pivot bolt for his front suspension hanging out. It was a miracle it hadn’t come out completely. To everyone’s amazement Oz had packed a spare nut that fitted exactly, by pure fluke obviously. Fixed. We were actually gone. We were now down to about half a litre each of water. The early start gave us a good six hours until the midday sun would come back to haunt us. Greg was on autopilot, unable to speak but able to ride. We kept him in front of us so we could keep an eye on him. Progress was slow but steady. More rock, sand, dust and the murderous desert wind. For some reason Greg began to ride with both feet on the floor as if he was trying to stop the bike falling over. On closer inspection we found him riding on a completely flat rear tyre. He knew it was flat but in his confused state he demanded to continue. He then began shouting repeatedly that we had to get out of the desert. Tyre fixed, we plodded on again. It was hard to make out at first, and we weren’t entirely sure if it was mirage or hallucination, but as we got closer you could definitely make out the shape of what looked like a fort, until eventually when we got close enough to realise it was a fort. Home to none other than the French Foreign Legion. And they had water. Cold, cold water. It was without doubt the best tasting drink ever to pass our lips. And it got better. They had showers, beer and food. Not even the moment when Greg caught his own vomit in his hands (only to then throw up through his nose) could take that luxury away from us.